textileartist.org is a great resource for textile artists, textile enthusiasts, students and educators. Here are just a few of my favourite articles and interviews. and many others including myself. This entry was posted in Embroidery, Sewing and Stitching, Textile Art, textileartist.org and tagged 62 group of textile artists, ann goddard, aran illingworth, embroidery, hand embroidery, jacqueline treloar, james fox, Machine stitch, Nigel Cheney, textile artist, textiles, tilleke schwarz on February 5, 2014 by womanwithafish. 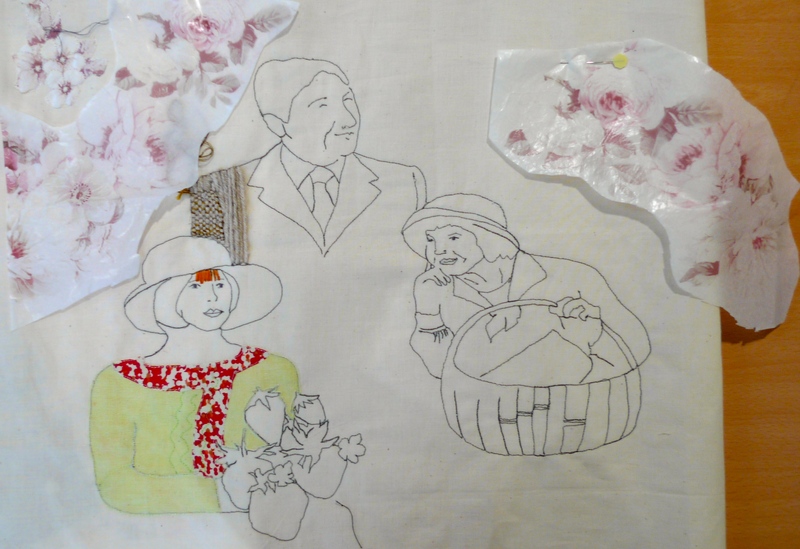 Anna Scott who is an Australian embroiderer and blogger has kindly posted about my work. Anna Scott : I am inspired…. It was so refreshing to get an email from Anna asking if she could use my images for her blog. Usually people just help themselves nowadays. I don’t really mind this on the whole as the images are usually used by students as reference material. Reproduction for financial gain would be another thing but images of my work can be found all over the internet and I like to share. She asked me why I use the image of a fish so often. It ‘s quite simple really. My hometown is Grimsby in Lincolnshire in the UK. Grimsby was once the largest and the busiest fishing port in the world and was known as the ‘ Klondyke of the East Coast of England’. Sadly this is no longer true, the northern cod wars with Iceland put paid to that and the place has gone to rack and ruin. Actually there are quite a few of my pieces that are about this very thing with references to a Grimsby St in London which has been knocked about somewhat in recent years. My family was very involved in the fishing industry both as fishermen and fish merchants so the fish has become my signature if you like, a symbol of where I’m from and I usually try to include on somewhere on my major pieces. The image below shows the first work in which I included a fish. 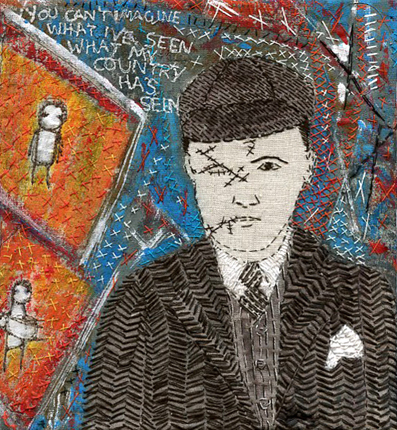 This entry was posted in Embroidery, Grimsby, London East End, Sewing and Stitching, Textile Art and tagged Anna Scott, embroidery, Grimsby, hand embroidery, Machine stitch, sue stone, textile artist, textiles on January 22, 2014 by womanwithafish. Tilleke Schwarz: For the love of threads – TextileArtist.org. Interesting article by Tilleke Schwarz on textileartist.org. Tilleke will be showing work at the Knitting and Stitching show. I am looking forward to giving a helping hand on her stand at Alexandra Palace in October. 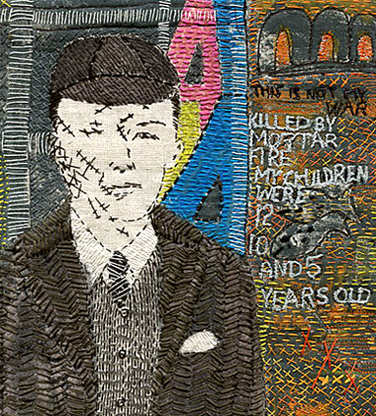 This entry was posted in 62 group of textile artists, Books, Knitting&Stitching show 2013, Sewing and Stitching, Textile Art, textileartist.org and tagged 62 group of textile artists, 62group, embroidery, exhibitions, hand embroidery, london, sue stone, textile artist, tilleke schwarz on September 15, 2013 by womanwithafish. Well, what I thought was going to be a quiet month turned out not to be so! I was contacted out of the blue by Cupola Gallery in Sheffield to see if I had any work available for their next exhibition ‘Kilter Kelter.’ The exhibition on a recycling theme is an intercontinental collaboration between Cupola Gallery in Sheffield and Spaza Art Gallery in Johannesburg, South Africa and runs from 26 July to 8 September 2013. I work a lot with recycled clothing and upholstery fabrics as a base for my stitching so I was delighted to be asked to be part of this exhibition. I also recycle images from my family and friends’ photo albums. 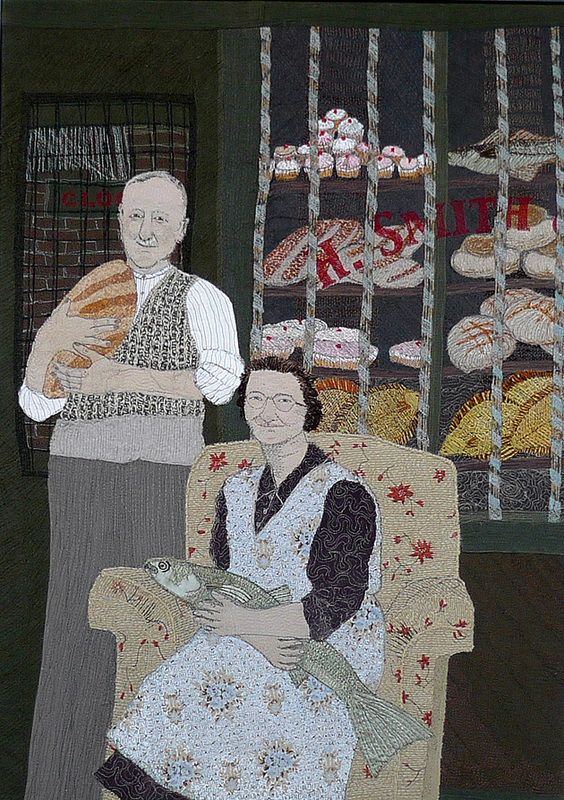 ‘Loaves and Fishes’, made in 2010 is portrait of my Grandparents Harry and Annie Jane Smith. The title refers not only to their religious bent (they were both staunch Methodists) but also to the fact that Harry was a Master Confectioner and Baker who ran the village shop in Saxilby, Lincolnshire for many years. The ‘Closed’ sign refers to the demise of the village shop with the advent of supermarkets and my signature fish on Annie’s lap refers to their hometown of Grimsby, once the busiest fishing port in the world. The piece is made from applied recycled fabrics with hand and machine stitch. Even the wool used for Harry’s jumper is recycled, unravelled from an old cardigan! I will also be showing some small studies including two pieces made from tray cloths embroidered by my Mum, Muriel May Stone. ‘Kelter’ is a local Yorkshire slang work for rubbish and ‘Takataka’ is Swahili for rubbish. So ‘Kilter Kelter’ meets ‘Take Takataka’ and on the opening night 26th July from 7.30 pm Cupola will set up a large screen and live web link so artists can share ideas and talk to each other across continents. Some of the smaller African Art works will also be available to order via Cupola. Work ranges from dresses made from salmon skins and old maps and elegant reclaimed steel scuptures, stunning portraits made from cardboard boxes to amazing paper and textile collages, miniature paintings on bottle tops and jewellery made from old colouring pencils. This entry was posted in Art Galleries, Cupola Gallery, Embroidery, Recycled, Sewing and Stitching, Textile Art and tagged Cupola Gallery, embroidery, exhibitions, hand embroidery, Machine stitch, recycled, recycling, Sheffield, stitch, sue stone, textile artist, textiles on July 19, 2013 by womanwithafish.